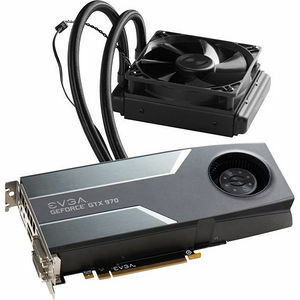 Introducing the EVGA GeForce GTX 970 HYBRID, an "all in one" water cooling solution that significantly lowers the GPU operating temperature. Best of all? The water cooler is completely self-contained, with an included 120mm radiator and fan. No filling, no custom tubing, no maintenance. Just plug in and play! Of course, the GeForce GTX 970 HYBRID is also powered by the next-generation NVIDIA Maxwell architecture, giving you incredible performance, unmatched power efficiency, and cutting-edge features. Maxwell is the most advanced GPU architecture ever made, designed to be the engine of next-generation gaming. Inspired by light, it was designed to solve some of the most complex lighting and graphics challenges in visual computing.